As we all know, layering is key in autumn fashion. I am completely obsessed with this new trend and I've linked some cute dresses below that would work well over jeans, my dress is from penny and is perfect for those not so summery days. You just never know what the weather is going to bring and layering different clothes can help to make sure you stay stylish whatever the weather. The dress over jeans trend is very new and quite different but it is really beautiful, elegant and chic. You can make your clothes work double-time with this trend, you will get twice as much wear out of your summer dresses! 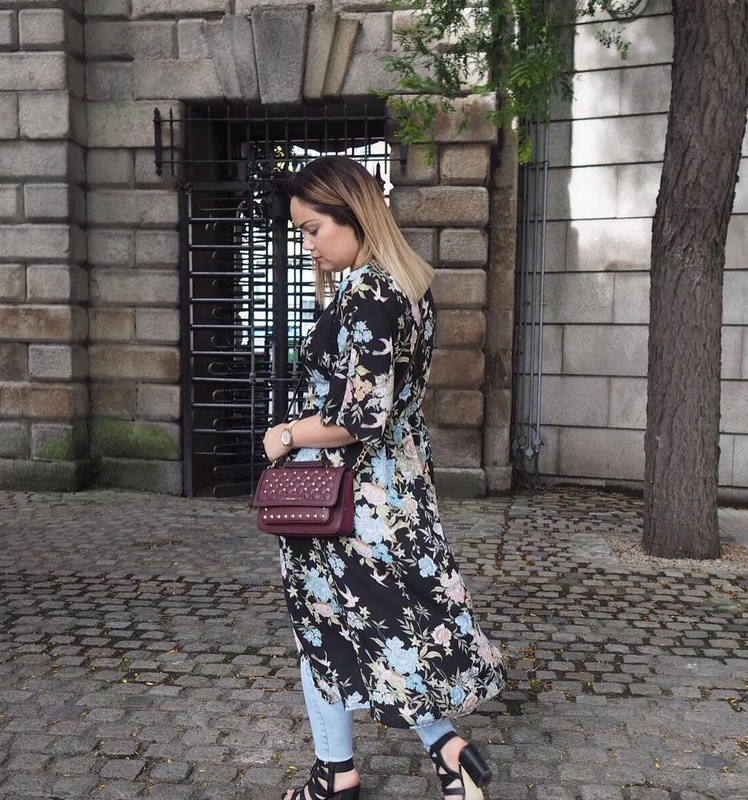 We all love a nice top and jeans, we all have a long blazer in our wardrobe we wear with jeans but with this trend you can go all the way and wear a dress over jeans too. These looks are perfect smart/casual outfits that are ideal for working gals, shopping, lunch dates or just running to the shops. Whatever you get up to, you will look your best if you pull off this trend. Here are five dresses that would look amazing over your favourite pair of jeans. If you are going to go for this trend it is essential that you really go for it! This pretty little mini striped cotton dress from & Other Stories could be your first attempt at the dress over jeans trend. The masculine looking oversized shirt is contrasted beautifully by the high neckline and feminine frills. Shop this dress here. A crisp white shirt is a must-have in every wardrobe, it is simple, sleek and stylish every single time. You can still stick to the same rules with the dress over jeans trend. 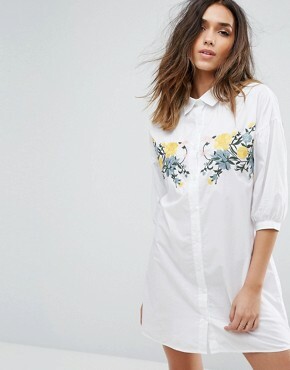 This white shirt dress from ASOS would be perfect over blue jeans - a touch of embroidery keeps a summer feeling to this look. Shop this dress here. 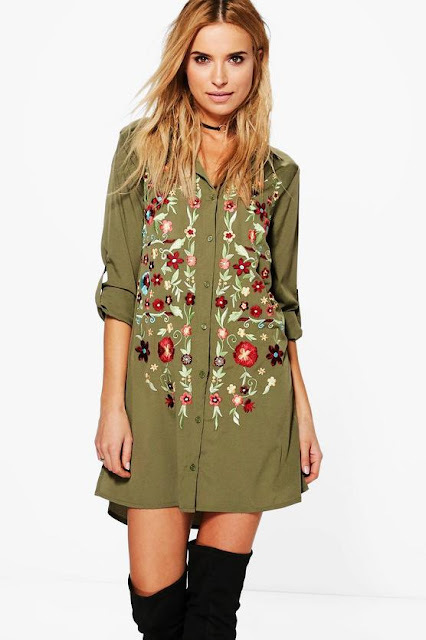 How stunning is this khaki embroidered shirt dress? It is so simple to wear as it does all of the work for you and it looks great with the thigh high boots in this picture, all you have to do to pull off this look is add jeans! Shop this dress here from Boohoo. 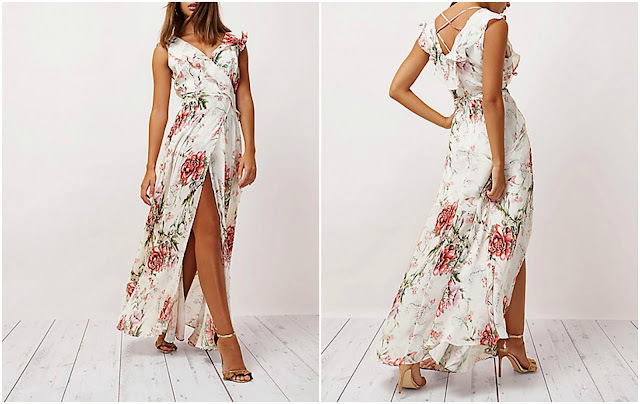 Step things up a notch with this beautiful flowing maxi dress from River Island. 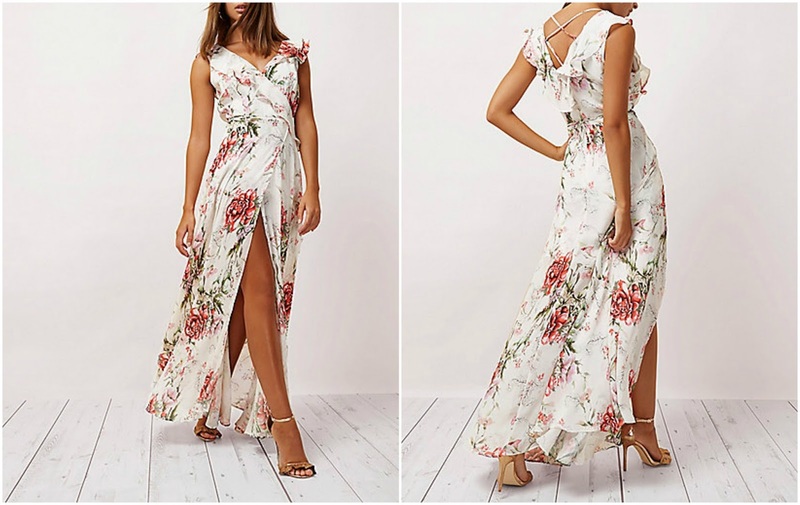 This dress will be a show stopper in your wardrobe and worn with jeans you will be able to bring a touch of summer with you into autumn/winter. The high split in the leg means this dress will fall beautifully over jeans. Shop this gorgeous dress here. If you are nervous about trying a new trend, monochrome is your best friend! you can't go too far wrong with an outfit if you keep it black and white. This striped dress is super classy, feminine and flowing. This would be gorgeous over skinny black jeans and sky high boots! Shop this dress from Topshop here.